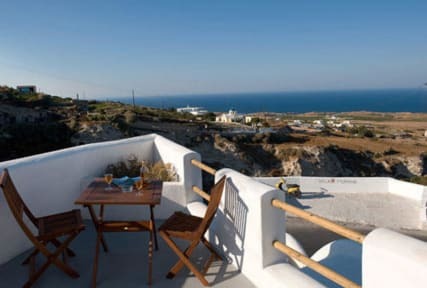 Villa Murano v Santorini, Řecko: Zarezervujte nyní! Newly built, in 2010, Villa Murano is located just a few minutes away from the center of Fira. Villa Murano was built according to the traditional architecture if Cyclades. It has beautiful exterior and comfortable rooms. Our hotel provides transfer from the airport and port with a private bus. The friendly and the helpful staff of the reception are always willing to provide you with all the information about Santorini and teh places you should visit during your stay.